open to all -- whether you’re a collector, want to start collecting, or simply want to have fun! Please join us. ▼ SCROLL DOWN FOR EVENTS DETAILS! 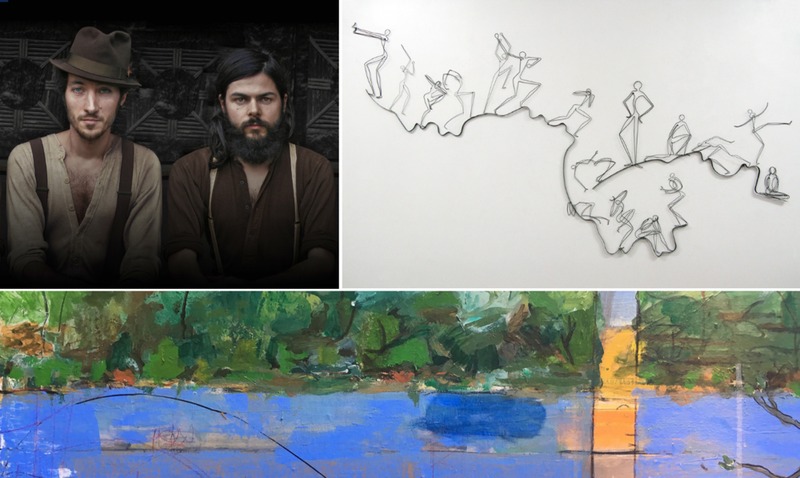 Join Vessel Gallery for a night of art and music. We'll kick off the night with a demo by exhibiting artist Pamela Merory Dernham, who creates sculptures of figures “drawn” with steel wire. Mingle and explore the exhibition on view, This Land We Share, that looks at landcape through a contemporary lense. We'll finish off the evening with a performance by local musical duo Wolf & Crow. The band's original music explores folklore, personal and interpersonal landscapes, and our connection to the earth -- themes shared by the artists Pamela Merory Dernham and Walter James Mansfield in This Land We Share. And I will fear no evil." Explore Oakland's murals with Vessel Gallery and Oakland-based painter and muralist David Burke. During the tour, we'll take a closer look at some of the beloved Oakland murals. Meet us at 2pm at Vessel Gallery, 471 25th Street. Wear your walking shoes as we'll travel to the various murals on foot. We'll grab a drink after the tour at Vessel Gallery to continue our conversation on murals, art, and Oakland. We'll go to murals in the Uptown and Downtown neighborhoods in Oakland. We'll finish the tour back at the gallery. Join MOTIVE artists Christa Assad, Pamela Merory Dernham, Bella Feldman, Iris Polos, and moderator Dewitt Cheng for a conversation focused on women's voices and war. The panel will discuss and reveal the perspectives of those who are frequently left out, quieted, and often more empathetic, in the conversations regarding war. Christa Assad is a teacher, traveler and full time artist with an MFA from Indiana University (1999), and BA from Penn State (1992). Assad’s work is in the permanent collections of The Fine Arts Museums of San Francisco, Cafesjian Center for the Arts (Yerevan, Armenia), The Ceramic Research Center at Arizona State University Museum, and The Penn State Fulbright Scholar Collection. She was named, “Ceramic Artist of the Year,” in 2012 by Ceramics Monthly. Her work is represented by Harvey Meadows Gallery (Aspen, CO), and Vessel Gallery (Oakland, CA). Pamela Merory Dernham is an Oakland, California-based artist who exhibits nationally and whose work is collected internationally. She has exhibited her work extensively in the Bay Area, including California College of the Arts (2006), San Jose Institute of Contemporary Art (2005), and a solo exhibit at the di Rosa Preserve (2004), amongst many other. She is an active member of the Pacific Rim Sculptors Group and was also active in the Alumni Council of CCA. Bella Feldman – fifty years into her career and still innovating – has more to say, more art to make, and more people to reach. Feldman communicates through metaphor, juxtaposing the strength of steel and the fragility of glass, deftly crafting large and small scale sculptures – from series of elegantly composed “Flasks of fiction” to playfully poignant “War Toys”. A pioneer among women sculptors, Feldman creates tension through her materials and expresses themes drawn from her own life experiences – including the Depression, the Holocaust, and many wars. Although she and her work appear tough as nails, neither is invincible. Her life (and ours), like the glass blown into her sculptures, is delicate. Feldman’s message is timeless and delivered in a curious fashion that never ceases to compel us to look, think, and engage in her art. Iris Polos is a visual artist, wildlife enthusiast, and activist of Greek descent who splits her time between the San Francisco and Monterey Bay areas. She earned her MFA in painting from California College of the Arts and has exhibited her work nationally. In 2012, Polos suffered an injury to her right hand when walking her rescue greyhound, Zoo. In order to keep working, she had to learn how to draw with her left hand--or rather, she had to revive that skill: when she was a student, she was so adept at drawing that her teachers required her to draw with her non-dominant left hand. In her work, Polos tries to knit together the fabric of life that others have studiously tried to unravel: animal to animal; person to person; personal to universal; abstraction to realism; life to death. Explore Oakland's murals with Vessel Gallery and Oakland artist Dave Young Kim. During the tour, we'll take a closer look at some of the beloved Oakland murals in Uptown and Downtown that we've all seen, but perhaps not had a chance to examine. Kim, who has painted murals in Oakland and across the world, will look at murals that investigate the human condition and how we're all interconnected. Meet us at 2pm at Vessel Gallery, 471 25th Street. Wear your walking shoes as we'll travel to the various murals on foot. We'll grab a drink after the tour at a nearby watering hole so we can continue our conversation on murals, art, Oakland, and the human condition.